Today we have a delightful interview with Jenn McKinlay, author of a new contemporary romance, THE GOOD ONES, and Fresh Fiction reviewer Miranda Owen! Thank you – you’re very kind! As for the new series, I was looking for something new and different that I hadn’t seen before and then I started following The Ripped Bodice on Instagram. For those who don’t know, The Ripped Bodice is a romance bookstore (the only romance bookstore in the U.S., I believe) and it’s run by sisters Leah and Bea Koch. They are funny and smart and wonderfully engaging so they were my kernel of an idea that I took to North Carolina and added a rescue kitten, of course, and a hot cowboy architect guy, natch. Friends. My books are always built around groups of friends. My entire life has been spent traveling in various squads – I have my mom squad, writer squad, library squad, top tier girl squad…you get the idea. I’m fortunate that my Hub and our two hooligans are my current squad, but, yeah, I’m a pack animal and make friends pretty easily so my stories reflect the same. What are the differences in writing romance versus mystery? What’s most difficult and what’s your favorite part of writing each? For me, romance is so much harder than mystery. I mean, a dead body really moves a plot along, you know? Good romance writing requires depth and honesty and genuine conflict but I write primarily comedy so it’s a real plate-twirling-on-a-pole-while-on-rollerskates balancing act to get all the notes right. Mysteries have a certain emotional distance that makes it less taxing for me to write, but plotting the red herrings, curating the suspect list, and giving the sleuth an authentic purpose to be engaged in the mystery, yeah, that requires some serious brain juice, so they’re both difficult but in different ways. My favorite part of both genres is when I type THE END on whatever manuscript I’m writing. Truly, it is the best feeling in the world! As far as I know, just two. I have an idea for a third but I’m booked to write several more mysteries so I have no idea when I’ll get to it or if the publisher will be interested in pursuing the series. You recently asked fans if they’d like to see Mel tie the knot in the next Cupcake Bakery mystery series. As a fan – I vote “yes”, but I’d also hate to see the end of that series. My hope is that Mel and Joe get married and sleuth on. I’m very eager to try out the dynamic of a married couple as amateur detectives. My other thought was that it might be time for a spin-off. My husband has been asking me (for years) to write a series with Marty and Oz, who are side characters in the series, as the lead characters. I love them both so…maybe? I have just finished the latest London Hat Shop mystery! It was wonderful to have the publisher bring that series back! And I am also working on a super top secret new idea that I’m not allowed to talk about…yet. Thanks to Jenn and Miranda for this wonderful interview! 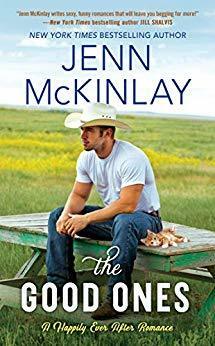 Jenn McKinlay’s latest novel, THE GOOD ONES, is available now. Jenn McKinlay took her first decoupage class when she was twelve years old. Since then, cutting and pasting have become a way of life. With two small children at home, she finds decoupage a fun craft as well as a very handy tool, especially when used to cover up doodles made in permanent marker on otherwise lovely furniture. And yes, they know her by name at her local Michael’s Craft Store. 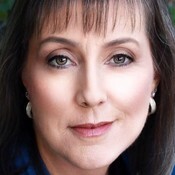 She is the author of three previous novels under the name Jennifer McKinlay and lives in Scottsdale, Arizona with her musician husband Chris, their two sons, two cats, one dog and one fish.